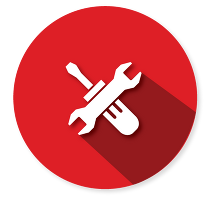 During the garage door Maintenance Service: garage door parts will be tightened and lubricated for smooth operation. Having your door maintained will not only give you convenience, but it will also provide safety for your family and extend the life of your door. Wipe everything clean, and then apply light oil, such as 3-in-1 lubricant, to the same parts. Inspect the tracks to make sure there is no debris to catch the rollers. Wipe them out or vacuum if needed. Lubricate the rollers with regular engine oil. Put a drop on each roller and allow the rolling action to draw it into the bearings. Don’t use grease, it will just gum up the tracks and collect hair and debris. Check cables for any sign of fraying and make certain that springs are tight and connected. Lightly lubricate any bearings and garage door hinges. Check the spring to make sure that it is “wet” or lightly lubricated. If it gets dried out, it will clump and jam up your system. Check any weatherstripping along the sides of the doors. Adjust if it is jamming against the sides, and replace if necessary. Garage door maintenance is often needed on the door opener. If your garage door opener is operated by a chain or drive screw, apply the same lubricant to the full length. Rust is a major enemy for any garage door. Yearly maintenance can help keep it away. Make garage door maintenance an annual project, spring or fall is great time for Garage Door Maintenance. If the opener raises but won't close the door, the safety beam sensor may be faulty, misaligned, or unplugged. A remote control that doesn't work may be something as simple as a weak or dead batteries, an antenna wire on the opener that isn't properly exposed, or a dead transmitter. If the opener is operating but the door doesn't open, the problem may be due to a worn gear or chain-drive sprocket, a broken chain, or the door disengaging from the operator. If the remote control only operates the door when it's located 25 feet or less from the opener, the battery in the remote is weak or the signal is poor. A door that reverses while closing or that doesn't completely open or close is usually obstructed or binding. This condition can also be caused when the open limit or sensitivity is set wrong.